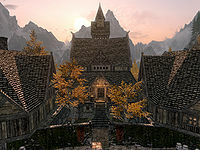 It is home to three Priests of Mara: Briehl, Dinya Balu, and Maramal and also the Priest of Arkay Alessandra who spends her days in the Hall of the Dead. It is located between Riftweald Manor and Black-Briar Manor in the eastern part of the city. It has it's own courtyard with a flight of stairs flanked by lit braziers leading up to the entrance. The Hall of the Dead is beneath the temple. The main entrance leads directly into the main room for worship with the centerpiece of the Temple, a statue of Mara opposite, against the east wall. There are rows of wooden benches facing the altar in front of the statue. On the altar is a copy of Gods and Worship and a Shrine of Mara, that when activated confers the Blessing of Mara, which reduces the cost of Restoration spells by 10%. There are two further shrines, both in the main room on narrow tables, one on either side of the entrance at the rear of the room. Either side of the Statue are planters containing a bunch of lavender, a dragon's tongue plant, a blue and a purple mountain flower plant. Above these hang banners of Mara. In front of the altar is a long master locked chest. 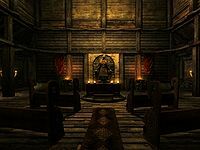 Against the east wall is a wooden bench, and two sets of shelves, these hold copies of Aedra and Daedra, A Children's Anuad, The Monomyth and Trials of St. Alessia along with a drum, a flute, several cups and goblets, with a lute leaning against one of the shelves. There are two doors, one to the northeast and the other around the corner in the northwestern corner. Against the south wall is another wooden bench and set of shelves which hold a complete set of all eight volumes of The Song of Pelinal, a couple of candlesticks and goblets. A third door is in the southwestern corner, while opposite in the southeast corner is an alcove with a couple of barrels of foodstuffs. The door to the southwest leads into the bedroom used by two of the priests, Briehl and Dinya Balu and consists of two single beds coming out from the west wall, a small round wooden table and two chairs against the south wall and a set of shelves against the east wall. On the table is a copy of A Kiss, Sweet Mother, a bottle of alto wine and a note from Talen-Jei asking Drifa to intercede with Maramal regarding his wedding to Keerava, which must have worked due to the quest available from Talen-Jei. The set of shelves hold a potion of minor healing, a potion of minor stamina and several pieces of cheese. The door in the northeastern corner leads to a cooking and dining area with a cooking pot on a stand against the west wall with a couple of food barrels to the left. A cupboard, a round wooden table and set of shelves all against the east wall. The cupboard holds a bottle of Nord mead and a bottle of alto wine. On the table are two baked potatoes, a bottle of wine and bread and cheese. On the shelves are five potatoes, a cabbage a couple of loaves of bread and several pieces of cheese. Hanging from the ceiling are two garlic braids, three bunches of elves ear and three bunches of frost mirriam. There is also a door to the south that opens into Maramal's bedroom. There is an owned double bed coming out from the middle of the south wall with a dresser at the foot of the bed. On the dresser are a bunch of lavender along with a purple, blue and red mountain flower. To the right of the bed is a chair. Against the east wall is a round wooden table and chair, with a ruined book, a potion of minor healing, a potion of minor stamina and a bottle of alto wine on the table. Beside the door against the north wall is a wardrobe containing clothes. The third door in the northwestern corner of the main room opens to a flight of stairs leading down to the cellar, with a couple of food barrels beside the top of the stairs and more at the bottom of the stairs in a storage area. There is a door in the east wall and another in the south wall. To the right of the second of these is a cupboard and set of shelves, the cupboard only holds clutter, while the shelves hold three bottles of Nord mead, two bottles of alto wine and a bottle of wine. Under the stairs is a large vat and a pile of firewood. Hanging from the ceiling are three pheasants, a rabbit, three garlic braids, two bunches of elves ear and a bunch of frost mirriam. 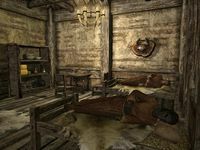 The door to the south leads to the Hall of the Dead, while the door to the east opens into a bedroom used by Alessandra, Priest of Arkay. This bedroom consists of an owned single bed coming out from the south wall, with an end table to the right and a chair to the left. On the end table is a bottle of wine. Against the east wall is a wardrobe and against the north wall is a long wooden table and chair. The table holds a ruined book, a bottle of wine, a baked potato, some bread and cheese. Esta página foi modificada pela última vez à(s) 00h30min de 8 de novembro de 2014.